QUẢNG NINH — The northern coastal province of Quảng Ninh is accelerating ground clearance work and investment procedures to start construction work on the Móng Cái -Vân Đồn highway this month. The highway will be constructed under a build-operate-transfer (BOT) and public-private partnership (PPP) contract at the total cost of more than VNĐ11 trillion (US$474 million). The provincial People’s Committee has signed the contract with a joint venture of Long Vân Infrastructure Investment and Development Co., Ltd, Vân Đồn Sun JSC and Công Thành Transportation and Construction Corporation. The 80.2 kilometre highway will have four lanes and is designed for average speeds of 100 km per hour. It will run through the districts of Vân Đồn, Tiên Yên, Đầm Hà and Hải Hà as well as Móng Cái City. Construction is expected to be completed within 22 months. Fees will be collected for 20 years on the highway. 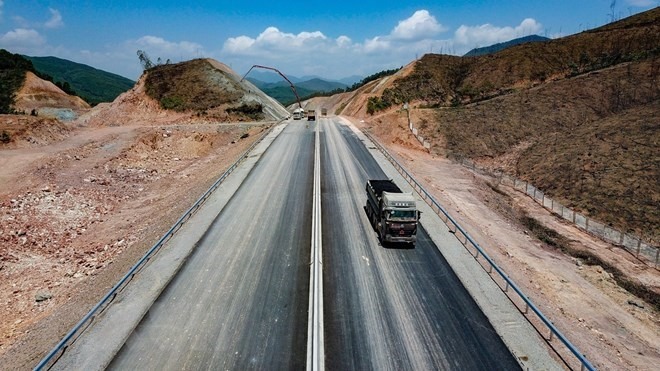 Once the road is completed, it will connect with the Hà Nội-Hải Phòng and Hà Nội-Lào Cai highways, creating the longest highway in Việt Nam running from the northern mountainous province of Lào Cai to Móng Cái in Quảng Ninh Province via Hà Nội and Hải Phòng. The highway will serve as an important transport gateway linking Việt Nam, China and countries in the Association of Southeast Asian Nations (ASEAN), helping boost cross-border trade and turning Quảng Ninh into a trade and service hub for the region. The highway is also expected to facilitate access to Vân Đồn International Airport, which is slated to open in late December.